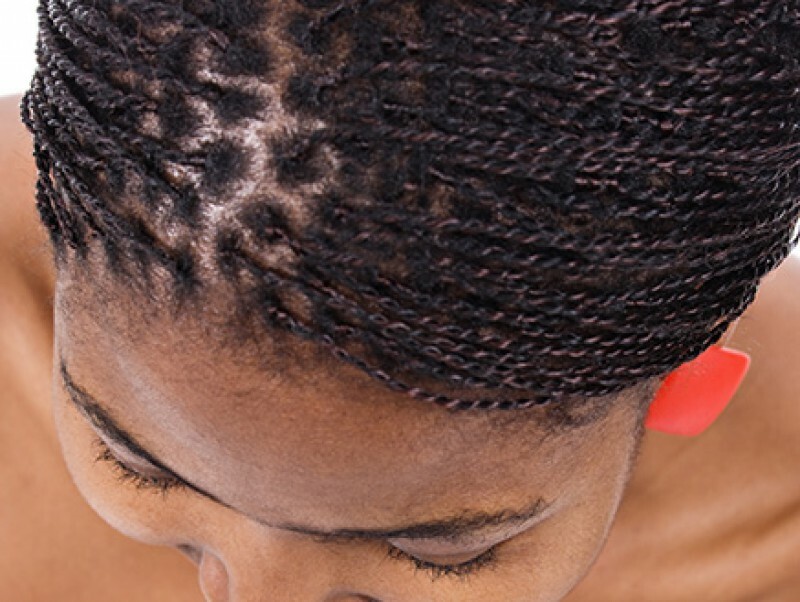 A 2% topical minoxidil solution was applied on the recipient bald scalp of sixteen patients aged 25 to 52 years with Hamilton classification of androgenetic alopecia from III to IV. Therapy began 4 weeks before surgery, then stopped during 3 weeks and started again for 3 months. 4 mm grafts were inserted into 3.5 mm recipient holes. A macrophotographic follow-up was done for 3 months on four grafts near a tattooed located area. On about 71% of the 64 grafts, partial or total hair is still growing without the shedding that usually occurs 2-4 weeks after transplantation. Topical minoxidil seems to be an adjunct for a better evolution of grafts after hair transplant surgery. 1 month before hair transplantation and started again 3 weeks after transplantation for 3 months. A macrophotographic follow-up of located grafts was done for 3 months. 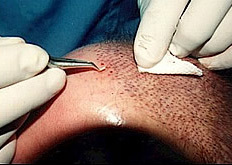 Several patients demonstrated hair growth in the grafts without the shedding that usually occurs 2 to 4 weeks after surgery (Figure 1). Hairs are still growing, whereas regrowth begins 3-5 months after surgery in untreated patients. Contrary to the opinion of many authors6 we have found that the postoperative shedding phase which occurs in the grafts about 3 weeks after transplantation is an anagen defluvium and not a telogen effluvium (Figure 2). Sixteen healthy male patients aged 25-52 years with Hamilton classification of androgenetic alopecia from HI to IV, who were undergoing a hair transplant procedure, participated in this open controlled study. Each patient was given a complete physical and biological examination. Beginning 1 month before surgery, each subject applied minoxidil 2%, 1 ml twice daily on the recipient area. This local treatment was stopped for 3 weeks and started again for 3 months. Sixty-four 4 mm punch grafts were harvested with a 4 mm power punch. The occipital area was infiltrated with a solution of 1% lidocaine and epinephrine. Saline solution was administered to increase tissue turgor. Twenty to 30 min elapsed between the harvesting and cleaning of the grafts and their insertion into the recipient area. During this period the grafts were placed in a saline solution at room temperature. All 4 mm grafts were transplanted into a 3.5 mm hole at an angle of about 60 °. A macrophotographic follow-up was done for 3 months on four grafts near a tattooed located area for each of the 16 individuals (Figure 3). The macrophotographic equipment is an Olympus OM2 with a 50 mm macro-objective, a telescopic tube, a lateral flash Olympus T32 (Figure 4) and a grid of our own fabrication screwed on the objective which outlines 0.25 cm2 areas7›3. The grid is applied on each located graft to be studied and the central 0.25 cm2 area is photographed. Three successive macrophotographs are taken on the grafted area and on each located graft on Day 0 and Day 90 (Figure 5). 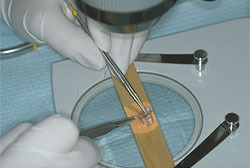 This macrophotographic technique enables objective assessment of hair loss and hair regrowth of each graft. We carried out 64 punch grafts of 4 mm on 16 healthy male individuals aged 25-52 years with a 2% minoxidil topical treatment. Hairs on grafts were counted at Day O, Day 30 and Day 90. 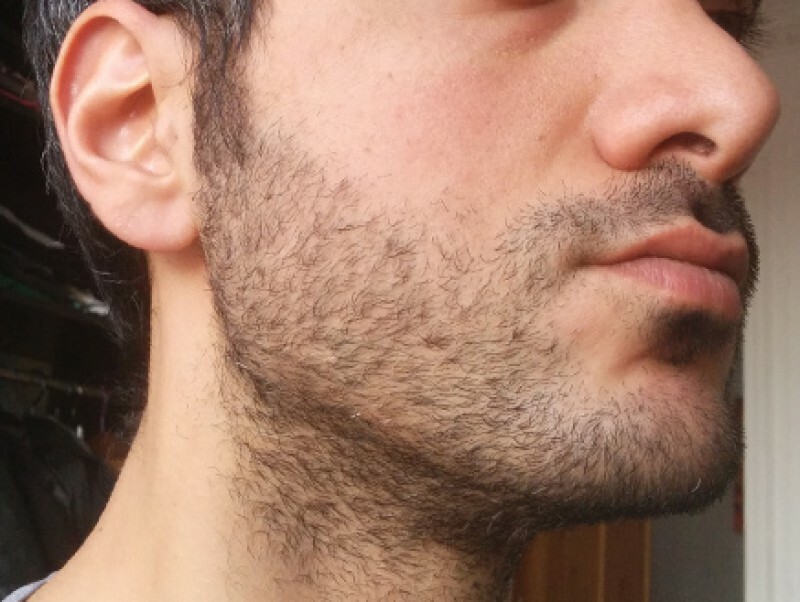 A 2% topical minoxidil solution used in preoperative and postoperative transplantation sessions seems to be effective on postoperative shedding and regrowth of hair on transplants. Contrary to many authors the postoperative shedding phase is not a telogen ef?uvium but an anagen defluvium. It is an explanation of the shedding hair which occurs 2-4 weeks after hair transplantation and the regrowth which begins 3-5 months after surgery in untreated patients. We have not found any report of immediate hair growth after hair transplantation without a prior shedding of hair. It is of considerable interest that, 30 days after a hair transplant session, hairs are still growing on about 71% of grafts but hair loss was less than 50% in about 3 1% of grafts (Table 1). Three months after transplantation hair loss was less than 50% on about 84% of grafts (Table 2). On the grafts some thick hairs 2-4 cm in length form the primarily growing hair, and some fine and short hairs form the new growing hair. 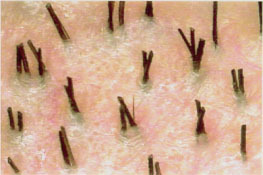 Topical minoxidil seems to allow an unceasing anagen stage and therefore to be an important adjunct for better evolution of grafts after hair transplantation (Figure 6).